A man named Joseph Lee invented the first automated bread machine in the 1800s. By the 1950s, the machine had become a staple in almost all major bread manufacturers at that time. The machine, however, was not yet designed for home use because of its size. 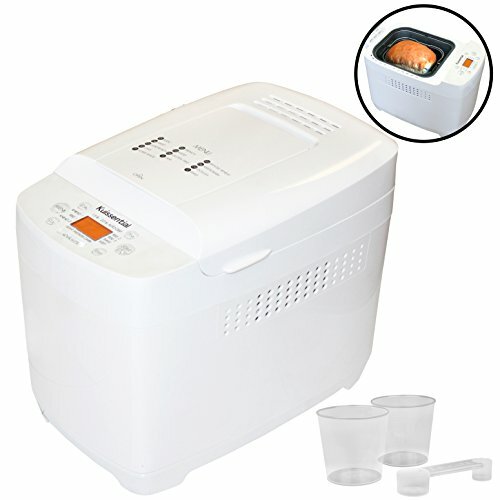 A Japanese company invented the first one-loaf bread machine in 1986. Modern bread machines came from this Japanese design. One problem people often run into when using a breadmaker is having their loaves stick to the pan and become difficult to get out in one piece. Instead of either dealing with a loaf that comes out in pieces or having to use a lot of extra oil inside your pan to ensure that your bread does not stick, when you opt for a bread maker that has a non-stick pan, you will not have to worry so much about this problem. Your loaf will easily slip out of the pan once it has finished baking and will be perfectly shaped so you do not have to worry about it having tears or missing pieces due to sticking to the pan. One of the main benefits of using a bread maker is not having to keep a close eye on the bread while it is in the oven baking. To ensure that you do not let your bread overbake or leave it in the bread maker for too long, it’s a smart idea to opt for a model that comes with an alarm. This feature will alert you when your bread has finished baking so you can quickly remove it from the bread maker and not have to worry about it either sticking to the pan as it cools or becoming overbaked. 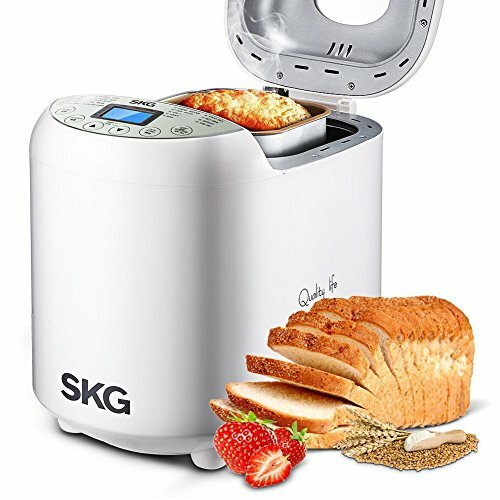 Getting started with a new bread maker can be a little daunting especially if you have never before made bread in your life. Instead of attempting to find a recipe that you hope will work with your new machine, when you buy a bread maker that comes with recipes already included, you can rest easy knowing that these recipes will work well with your bread maker. This will reduce the amount of stress and pressure you feel to create a great loaf, and will ensure that you are successful right away when using your new bread machine. Doing so will give you a boost of confidence and allow you to use tried and true recipes that are sure to work. 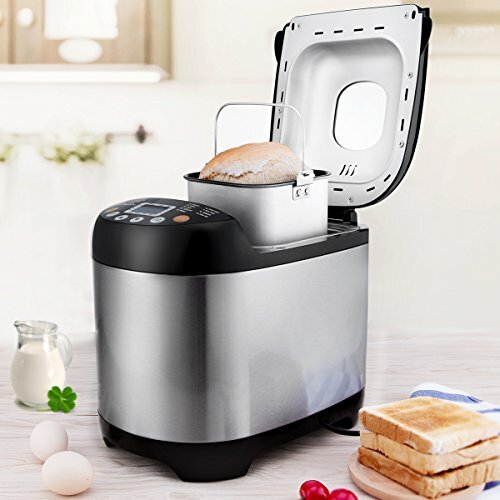 While there are many bread makers that only create one specific size loaf, if you want to be able to produce various sizes, make sure you choose a bread machine that will allow you to adjust your loaf size. This ensures that you do not accidentally overbake if you are only needing a small loaf for you and your spouse, but also allows you to create larger loaves that are perfect for taking to a party. Because you can easily adjust the size of your loaf to meet your needs, you won’t ever have to worry about whether or not you will have enough bread or your bread going stale before you can eat it. One of the main benefits of using a bread machine to help you with your baking is being able to add all of your ingredients to the machine, use the delayed start, and then have it bake your bread later when you’re not around. This is a great way to ensure that you always have freshly baked bread right before dinner or to take a little bit of the stress off of you when you are planning a party or other event. If you think that this feature is one that you will enjoy, then make sure that the bread machine you buy has a delayed start feature. It is this feature that will take a lot of pressure and stress off of your baking bread and allow you to rest easy on the day of your bake. Unlike older bread machines in the past, newer bread machines are programmable, which means that you can set the time that you are going to bake, the temperature, if there are going to be any items mixed into your loaf, and also adjust the settings of your machine so that you do not accidentally over or under bake your loaves. Because all flours bake differently, it’s important that you opt for a bread machine that is programmable so you can make sure you get an even and thorough bake each time you use your new bread machine. Bread machines without this feature may cost a little bit less, but you are going to give up a lot of the control that you have in creating perfect loaves if you do not choose one with this feature. If you are going to be using a delayed start feature or setting up your bread machine to bake at a later time, you want to make sure that it comes with a yeast dispenser. This will ensure that your yeast is not added to your dough too early, which can delay its growth and make it difficult for your bread to rise correctly. By adding your yeast at the exact right time in the mixing process, you can rest easy knowing that you get a fully risen loaves each time you use your bread machine. Not all bread machines come with this handy feature, which is a shame, as it will ensure that you that new bread bakers are able to create deliciously and will resume loaves with ease. Chances are very good that if you are going to be using a bread machine that you will not be around when the bread has finished baking. Part of the beauty of these machines is not having to stand around and monitor the hot oven, and having the freedom to leave your kitchen while your bread is baking is a very common reason for buying a bread machine. Because of this, looking for one that comes with an automatic shutoff is a great idea. This means that your bread machine will turn itself off when the baking cycle is finished and will not continue to run. If you do not have a bread machine that comes with this automatic shutoff feature, you will have to make sure that you are nearby to shut off the machine when it has finished baking. Otherwise, you will likely suffer from overbaked bread and may even put your family at risk of a fire. One issue that some people have with bread machines is that they can be very noisy and distracting while they’re operating. Because of this, some homeowners find that they do not want to use their bread machine either at night when they are trying to enjoy a quiet evening with their family or in the morning when people are still sleeping. You can get around this problem by opting for a bread machine that has a direct current motor. This type of motor is much quieter than others and will allow you to easily use your bread machine without worrying about waking anybody up. You will have to worry about sacrificing power, as a direct current motor is strong enough to handle any bread baking needs. Make it easy to tell exactly how much longer your bread will be in your bread machine when you choose an appliance that has an LCD display. Large LCD display panels make it incredibly easy to check not only the time remaining on your loaf of bread but also the settings you chose so you can make sure that you are following your recipe correctly. Unlike bread machines with small and dark displays, a large LCD display it’s easy for anyone to use, no matter your age or eyesight. It’s hard to argue that one of the most delicious ways to eat bread is while it is still warm and fresh out of your bread machine. Unfortunately, many people have busy lives and may find it very difficult to time being at home when their bread is done so they can enjoy fresh bread out of the machine. It’s easy to extend the amount of time you have to get to your fresh bread by looking for a bread machine that has a warming setting. These will usually hold your bread at a warm temperature for up to an hour and a half after they have finished baking without drying out your bread or causing it to become too dark and hard. Some bread machines are able to do much more than simply make a great loaf of bread, and if you love the way fresh jam or jelly tastes but don’t want to have to stand over the hot stove storing your jam for a long period of time, then choosing a bread machine that can make jam for you is a great way to enjoy your fresh jam with nice hot bread. When you opt for a bread machine that has this feature, you will be able to add your sugar, pectin, fruit, and lemon juice to the bread machine, plug it in and allow the machine to make your jam for you. Your bread machine will be able to quickly cycle through the jam making process so you do not have to worry about heating up your kitchen or spending your afternoon stirring a pot of jam on the stove. While most of the time you may be able to plan ahead for when you want fresh bread, there are going to be some days when you are in a rush and need to get a loaf of bread baked quickly. If you find yourself in this position, then the best way to ensure that your bread is baked on time and baked correctly is to use a bread machine that has a rapid bake mode feature. While this feature may not result in a loaf of bread that has the same depth of flavor from one that is allowed a slower rise, it is the absolute best way to get freshly baked bread on the table in a rush. Even if you have last-minute dinner plans, you will be able to bring a lovely gift or ensure that you have fresh bread for your guests. As you become more and more comfortable with your bread machine, it is normal to want to create various loaves that have nuts or dried fruits mixed into the dough. Mixing these items into the dough before the first rise will hinder the rise that you are able to get and can make it difficult for your dough to expand and rise correctly. Instead, when you choose a bread machine that will be able to add your dried fruit and nuts at a later time, you can rest easy knowing that they will be thoroughly mixed throughout the dough and that you will not hinder your dough from rising. There’s nothing that will decrease the joy of baking quite like having to wash all of the various parts of your bread machine by hand. 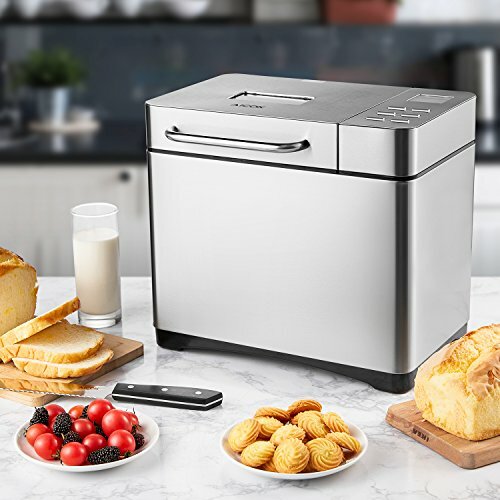 If you hate doing dishes and want to enjoy fresh bread without spending a long time at the sink afterward, then it’s a good idea to look for a bread machine that has dishwasher-safe parts. While you will not be able to put the whole unit in the washing machine, you should be able to place the removable pan in the dishwasher. This will the speed up the cleaning process after you have baked. It is very common for people who own a bread machine to want to be able to have a lighter or darker crust on their loaves. If you find yourself constantly trying to over bake your bread in the oven because you want a darker crust, you will want to look for a bread machine that has adjustable crust color options. This allows you to have a lighter or a darker crust without worrying about whether or not the inside of your bread is fully baked. If you do not want to have to try to figure out the best settings, time, and crust color for your perfect loaf of bread, then it’s a good idea to look for a bread machine that comes with preprogrammed settings. These machines often have a variety of different cycles you can choose from so you never have to worry about whether not you are able to pick the perfect loaf. From baking white, whole grain, or French bread to providing a sourdough cycle or making yeast sweetbreads, this type of bread machine is incredibly versatile. While some people love to try to come up with the perfect loaf from their bread machine, others simply want to be able to add all of the ingredients and rest easy knowing that they will have a delicious bread in a short period of time. If you do not want to have to deal with changing settings on your machine, then a bread machine that offers a number of pre-programmed settings is the best choice for you. As more and more people require gluten-free diets, they turned to make their own bread at home because it is less expensive and often healthier than the options that they can buy in a store. Unfortunately, gluten-free beds require different baking temperatures, times, and conditions, which means that simply placing gluten-free dough in a traditional bread maker does not always work correctly. Instead, when you buy a bread machine that has been specifically created for baking gluten-free bread, you can rest easy knowing that all of the settings will work correctly with your dough. This means that no matter what combination of different flours you use, you are sure to end up with delicious bread that you and your family will love. If you have never used a bread machine before, it is helpful to get a unit that has a window on the top, as this will allow you to keep an eye on your bread and make sure that it is baked to your specifications. If you have never before used a bread machine, it can be really tricky to know exactly how long to allow your bread to bake, especially if you are making tweaks to the original recipe, which is why buying a bread machine with a window is a smart idea. Newer and more expensive bread machines often have features that will allow you to do more than simply bake a great loaf of bread. 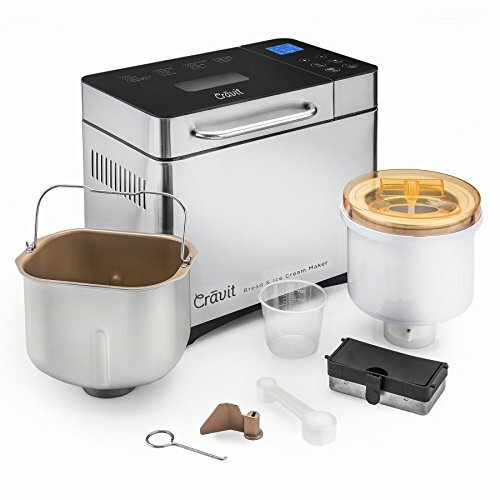 Just like there are some bread machines that have a setting for making jam, there are a few bread machine models that can actually make ice cream. By simply adding all of your ingredients and leaving the machine to work for a few minutes, you can have incredible, homemade ice cream faster than you can go to the store. One of the main benefits of having a bread machine is being able to make a fresh loaf of bread without much effort at all. If you and your family love the way fresh bread taste but tend not to eat your loaves when they have sat on the counter for a few days, you will be interested in a bread machine that can make a small loaf. A 1-pound loaf will be large enough for you to enjoy with a dinner and still have some left over the next day, but not so big that it will go stale on the countertop before you are able to eat it all. Larger families or ones that tend to eat their bread for a few days before wanting a fresh loaf can benefit from a 1 ½ pound loaf machine. Because this is not a very normal size, you’re more likely to find a bread machine with adjustable pans that can make this is one of the size options. It’s a little difficult to find a bread machine that only will bake 1 ½ pound loaves of bread. 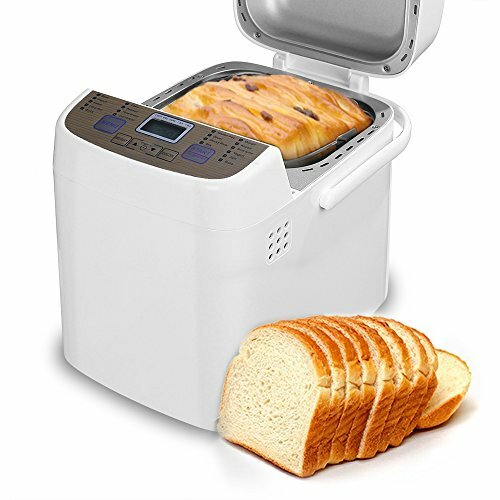 This is a very common size loaf for you to baking bread machine, making it very easy to find bread machines that either offer this as one of their adjustable size options or only bake 2-pound loaves. If you do bake a loaf of bread, the size it may be too large for your family, which case you have to freeze some of it, but that means you will always have bread around when you want some. 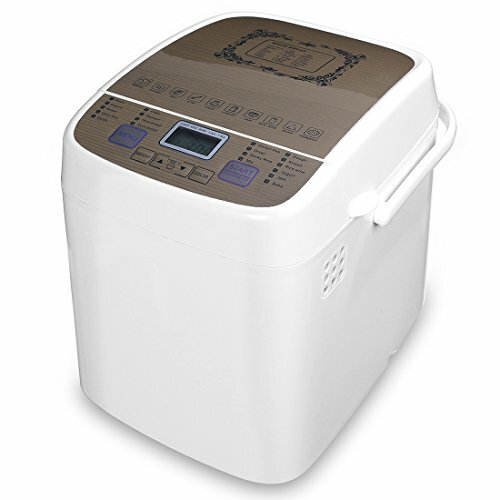 It is very rare to find a bread machine that only makes 2 ½ pound loaves. You’re much more likely to find a machine that has this size loaf pan as an option among other adjustable sizes. 3 pounds is a huge loaf of bread, and more than most families can use at one time without it going stale. However, if you have a business as a baker, provide fresh bread for restaurants, or simply love to entertain and want to have fresh bread at all times, then a bread machine that can bake 3-pound loaves of bread is a good idea.